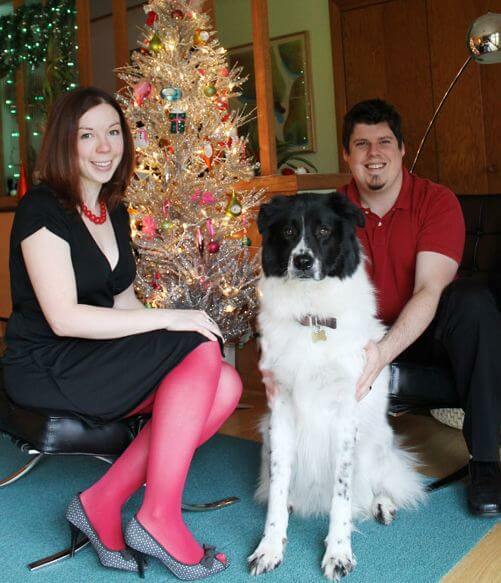 Kate, Jim and their pal Leo. Woof! online, consulting with my very handy dad, reading the instructions, and talking to the helpful guys at our local Ace Hardware, I realized I could totally do this and save myself some serious installation fees! Since I was just swapping out the old appliances for new ones, the wiring was simple. 2. 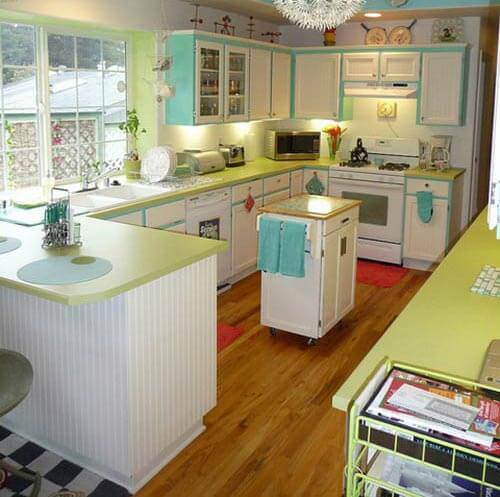 I did a lot of “looking around” online before I decided on how/what color to paint my cabinets. I could have painted them white and called it a day, which is fine (white is always a good choice) but I wanted something different. At first I thought I would paint my cabinets in the Mondrian style – (I did several blog posts with mock ups) but in the end, none of the mock ups felt right. 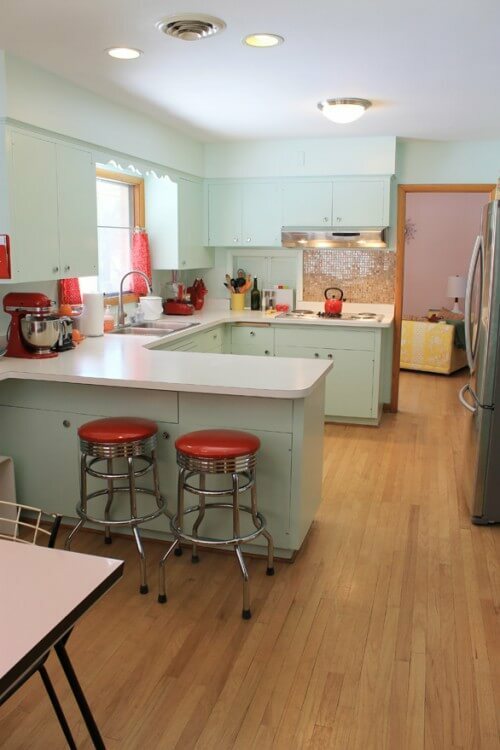 Then I found my inspiration photo of a mint green kitchen with white counter tops and pops of red. It was love! It just felt right for my kitchen. Painting the cabinets is a big job so you want to make sure you are totally in love with the color scheme before you leap! 3. When painting cabinets, many thin even coats are best! (I brushed on one thin coat of primer after sanding, waited 1 hour and then applied a thin coat of the paint with a foam roller. Then I waited at least 4 hours before applying a second coat of paint). Some doors were fine with two coats, some needed three. Then I waited 7 days before reinstalling the doors to make sure the paint had time to cure.) Always make sure to pay attention to drying and curing times for your paint/primer too because that can make the difference between a paint job that lasts years and one that lasts only until you bump into it! 4. Any project is doable if you set a schedule and budget and stick to it! When I first thought about painting the kitchen cabinets and replacing the microwave/cook top, I was instantly overwhelmed! Then I realized it would be easier for me to handle (and guess when I would be finished) if I broke it down into small chunks. 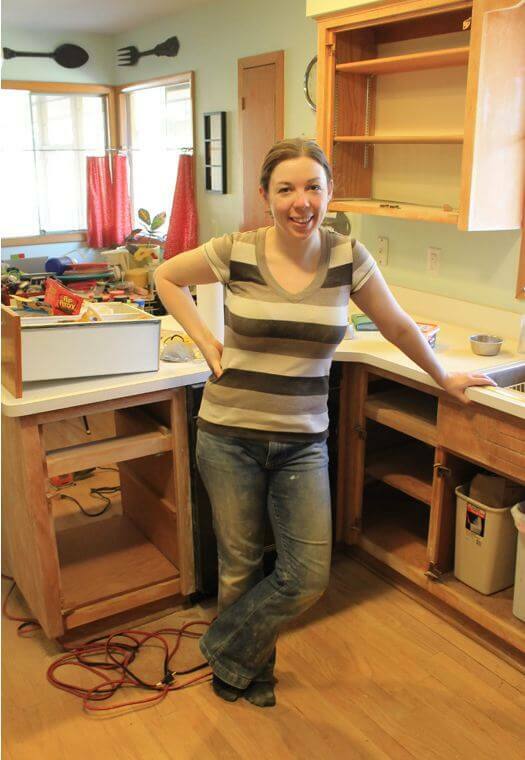 I had a set of tasks to do every weekend that I worked on the kitchen project (example: number/remove cabinet doors and drawers, empty cabinets, sand bases-would be one weekend) Then I gave myself weeknights after work off to recharge and avoid burn out. It worked great! I was done exactly as scheduled and while I did have some tiring weekends, I never got overwhelmed or burned out! Also, I bought nearly everything for this project on sale, which saved me some serious $$$ (and installed it all myself which saved more $$$). A quick tally shows I spent $771 on the kitchen remodel, but that number might decrease if I can sell the old cook top and microwave on craigslist to recoup some $$$. Cook top – Maytag 36 Inch electric cook top in brushed Chrome from Home Depot. Copper backsplash tile – Home Depot. Primer – KILZ Clean Start 1-Gal. Latex Primer, Sealer and Stain Blocker (Zero Voc!) From Home Depot. Thanks again for featuring my kitchen! I’m so excited!!!! 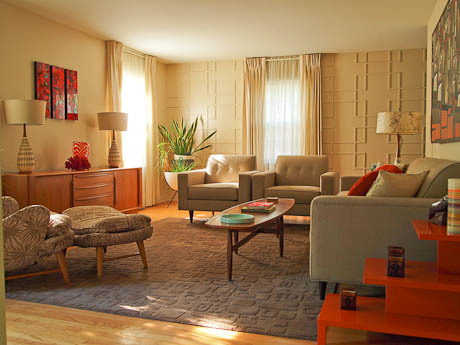 This renovation is yummy, and amazing, and cool. Just love it! 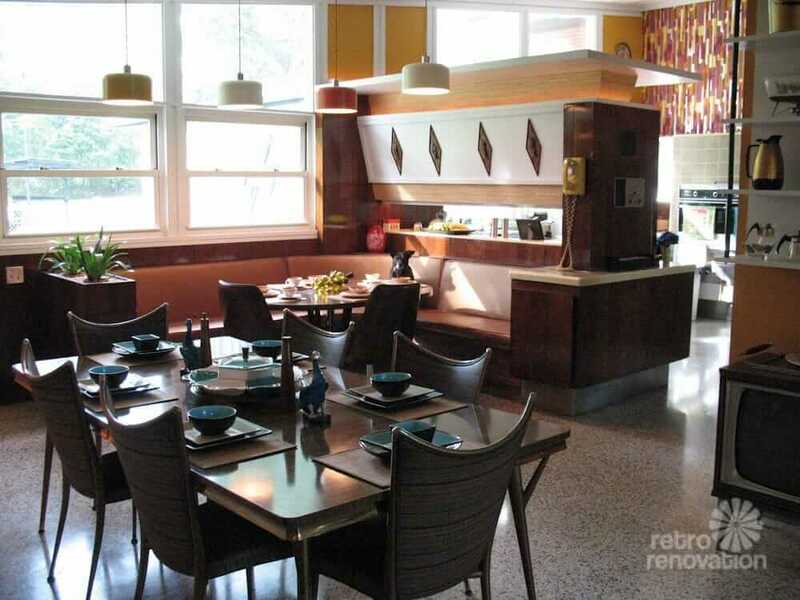 I came across your remodel post when I was searching for ideas about how to remodel our 1960s kitchen. 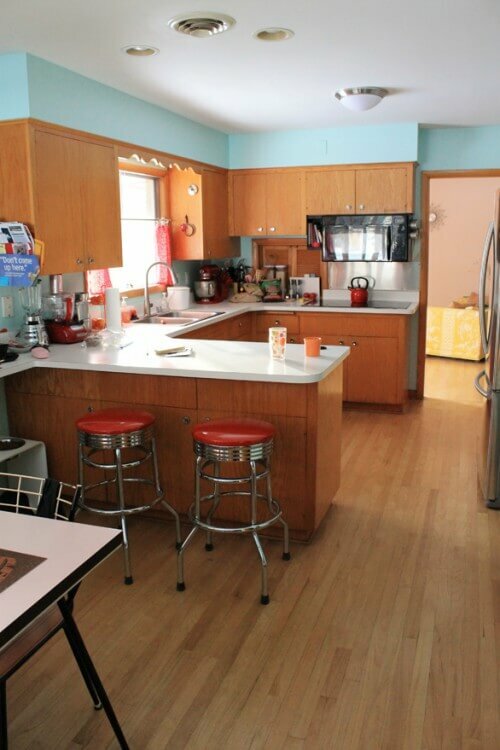 I was pleasantly shocked to see your kitchen layout is exactly, to the T the layout of my kitchen. You did a phenomenal job at a phenomenal price. VERY inspiring and I can only hope my kitchen turns out beautifully as yours did! I’m so impressed! Love it. But where’s the oven?